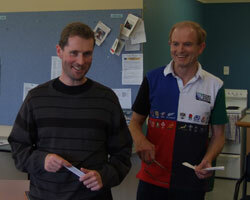 Open - 1 Paul Garbett $600 2 Bob Smith $450 3 Mike Steadman $300 4 L. McLaren $200. 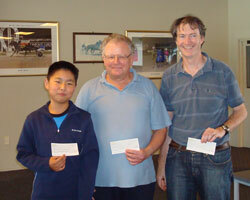 Under 2100 - 1 Alan Ansell $200 2 Roy Seabrook (taking 1st U1800 prize) 3 Hilton Bennett $100 4 John Duneas $50. 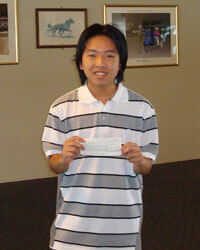 Under 1800 - 1 Roy Seabrook $200 2 William Li $100 3 Philip Mukkattu $50. 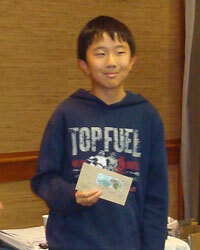 Under 1500 - 1 Hao Jia $200 2 Alphaeus Ang $100 3 William Zhang (taking 2nd Junior prize) 4 Leo Zhang $50. 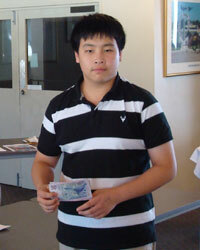 Junior - 1 Alan Ansell (taking 1st U2100 prize) 2 Luke Li $200 3 William Zhang $100 4 William Li (taking 2nd U1800 prize) 5 Hans Gao $50. 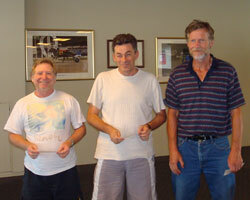 Senior - 1 Bob Mitchell $200 2 Peter Stuart $100 3 Wayne Power $50. 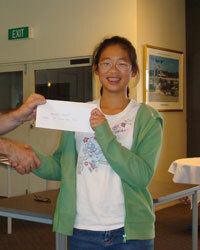 Female - 1 Helen Milligan $200 2 Viv Smith $100 3 Joy Qin $50. 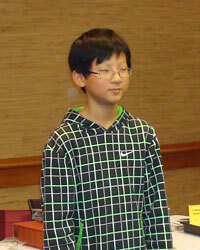 Under 12 & Under 1200 - 1 Judd Zhan $70 in chess books 2 Richard Jiang $50 in chess books 3 Allen Fan $30 in chess books. 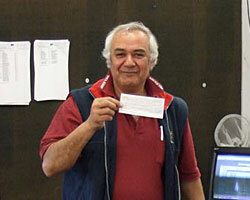 The regular reports from Coordinator Bob Smith, and the full details of points awarded, can be found on our Grand Prix page. 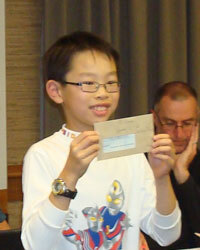 Prizes will be awarded at the Queenstown Chess Classic - please contact Bob Smith or Helen Milligan if you are not attending and need your cheque posted to you. December 11th 2011 - MC Cup Finals, Auckland. 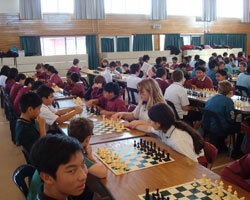 Photos and games here: http://www.chesspower.co.nz/webapps/i/88770/234127/396351. William Zhang won clear first and won the Under 10 prize, earning the title of MC Cup Champion.His name will be engraved on the MC Cup. 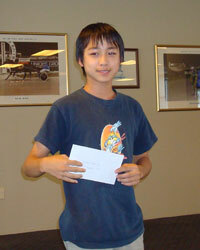 He gained free entry into all MC Cup events for the following year and a $300 cash contribution to the Queenstown Classic. 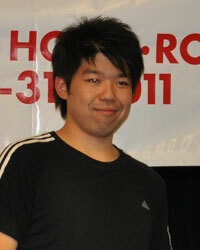 Johnson Chen came clear 2nd and Derek Zhang 3rd on tie-break over Allen Fan. 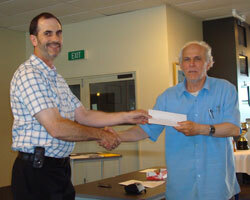 December 10th 2011- 4th Gordon Hoskyn Memorial, Palmerston North . Download games here (pgn file). Thanks to Stewart Holdaway for photos. Gretarsson (left) versus Mark Noble. Gretarsson versus Anthony Ker. 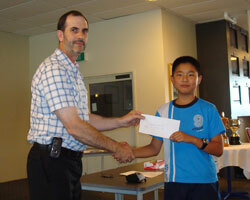 December 6th 2011 - Australian Interschools Open Tournament, AUSTRALIA. December 3rd 2011 - MIT Rapid, Auckland. 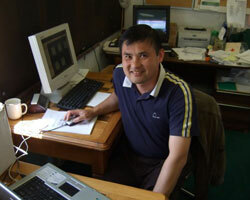 Thanks to Mark Jiang for photos. November 27th 2011 - MC Cup, Auckland. November 17th - 27th 2011 - World Youth, Caldas Novas, BRAZIL. 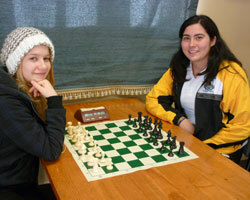 See the full results here: http://www.chess-results.com/tnr58150.aspx?art=0&lan=1&flag=30. Thanks to Halim Johari for a photo of the squad (below). Karl and Leo at the back, Farhana, Izzah, Aiman and William at the front. 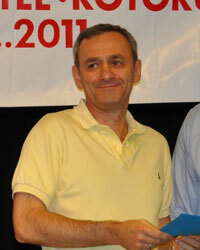 See also the official site, http://www.wycc2011.com/. November 20th 2011 - Wellington Rapid, Wellington. 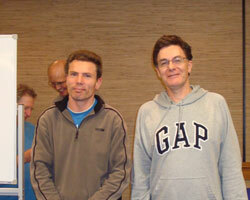 1st place went to visiting GM Helgi Gretarsson (Iceland) and 2nd was English FM Ben Hague. 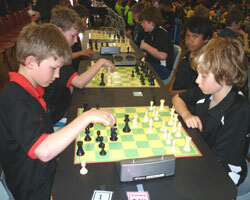 November 11th - 13th 2011 - Waikato Open, Hamilton. Thanks to Simon Lyall for photos. Scott Humphreys with winner Ben Hague. 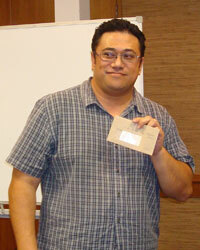 2nd place Noel Pinic. 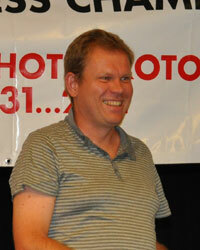 B-grade winner Michael Budd. October 30th 2011 - MC Cup, Auckland. 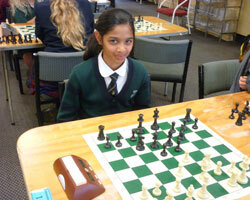 See full results and photos at http://www.chesspower.co.nz/webapps/i/88770/234127/390256. October 29th - 30th 2011 - Merv Morrison, Auckland. 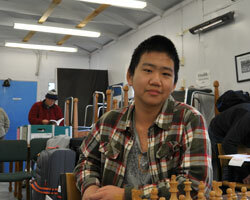 Many thanks to FA Keong Ang for giving us live coverage of the top 5 boards all weekend. Thanks also to Simon Lyall for the photos. October 16th 2011 - Hamilton Chess Club Mooving Rapid, Hamilton. 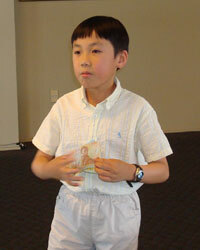 1st Ben Hague (England) with 6/6. 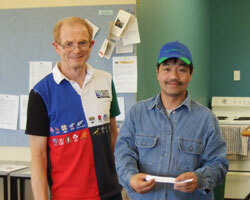 2nd= Noel Pinic, Daniel Han, Richard Dare, Michael Budd, William Lynn, Don Eade and Daniel Runcan 4/6. October 8th 2011 - Kapiti Rapid, Kapiti. September 25th 2011 - MC Cup, Auckland. 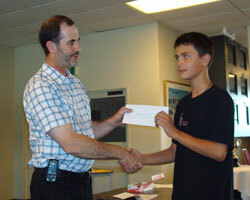 September 24th-25th 2011 - Interschools Finals, Mount Maunganui. 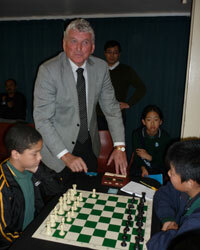 Thanks to Bob & Viv Smith and Mt Maunganui RSA Chess Club for organising these events, and thanks to Viv for the photos. 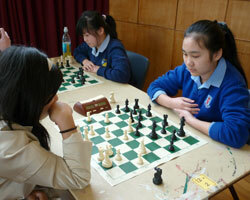 3rd Marshall Laing (21) Leo Zhang (6.5) Jasmine Pickston (3.5) Caroline Yan (7) Sarah Yan (5) Stefenie Pickston did not play. 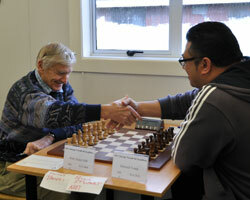 Tauranga city counsellor Terry Molloy (deputizing for the mayor) kicked off the tournament by making the first move one board 1 in the Intermediate section. 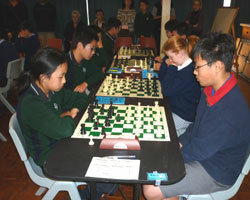 The move is for Hawera Intermediate's Armeen Jefta against Takapuna Normal's William Li. An interesting first move. 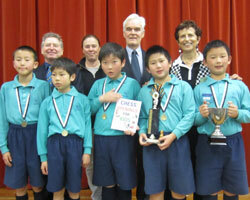 Front: Pigeon Mountain Primary team Yiwei Qi, Eugene Ngoi, Jonathon Ngoi, Richard Jiang and Judd Zhan. 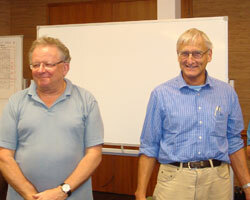 Back: Bob Smith, Carol Frear (team manager), Peter Moss (General Manager of Mt Maunganui RSA), and Viv Smith. 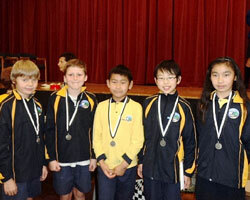 Runners-up Milford Primary: left to right Jack Julian, Michael Slessor-White, Martin Zhu, William Zhang and Crystal Zhu. Macleans College take the silver medal in the Secondary Championship. 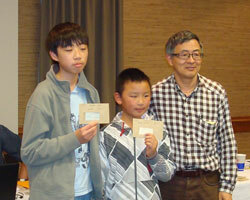 Left to right are Bill Li, Henry Jiang, Alan Chen, and Leo Zhu. Primary Champions Pigeon Mountain (left) play runners-up Milford. 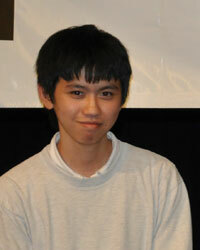 Board 4 Eugene Ngoi plays Milford's Michael Slessor-White. 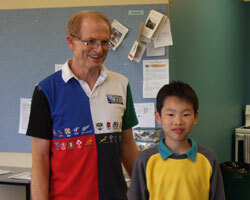 3rd place medal winners Marshall Laing (left) play Blockhouse Bay Primary. 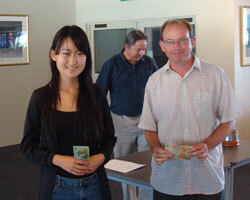 Sarah Yang in foreground against Blockhouse Bay's Kevin Wu on board 4. 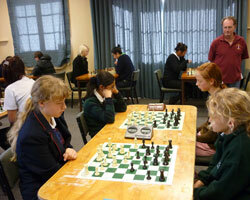 College St Normal (Manawatu) plays Maori Hill (Otago). 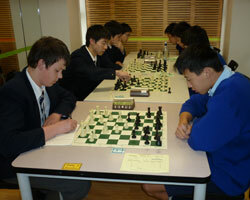 Luke Scott (left) playing Maori Hill's Nathan Xu. 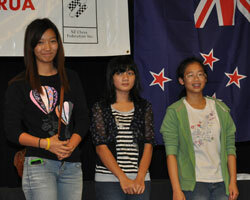 Intermediate champions Takapuna Normal playing Cobham Intermediate from Canterbury. 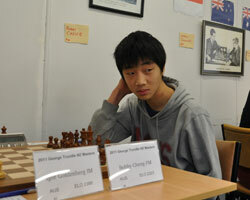 Takapuna's Bella Qian plays Black against Changgyun Han on board 4. 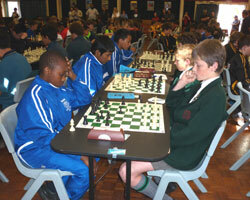 Hereworth School's Louis Clayton (left) plays Rosehill Intermediate's Kereama Mio-Romana on board 4. 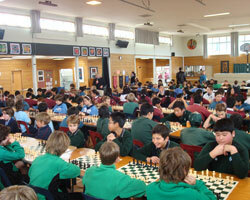 Rosehill Intermediate from Auckland playing Hereworth School (Hawke's Bay.) 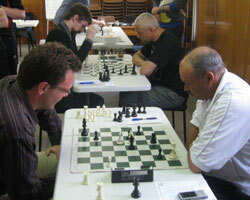 Rosehill's Tafadzwa Takawira (left) playing Andrew de Latour. 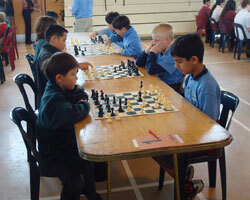 Papatoetoe Central Primary vs Ngaio School. 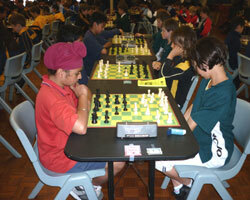 Satnam Singh plays Black against Ngaio's Layla Timergazi. 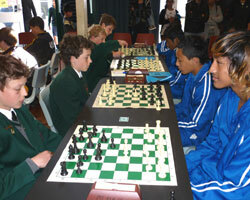 3rd place medal winners Palmerston North Boys High (left) take on runners-up Macleans College. 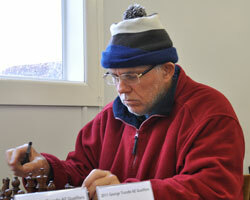 Jack James plays Macleans' Leo Zhu on board 1. 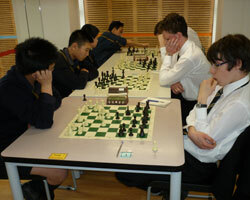 Champions Auckland Grammar (left) playing New Plymouth Boys High in the final round, with Hans Gao playing Alan Ansell in the foreground, while Daniel Shen verses Jesse Watt on board 2. 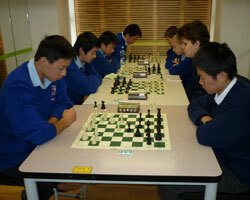 Runners-up Macleans College playing Bethlehem College, with Leo Zhu (left) playing Ray Qian from Bethlehem on board 1. 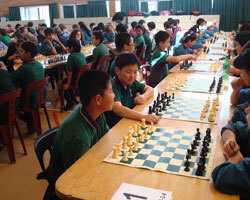 September 20th 2011 - Auckland Interschool Primary and Intermediate Finals, Auckland. 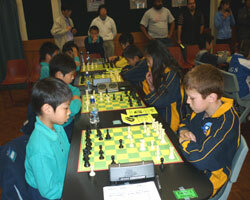 starting September 16th 2011 - Chess for Miracle FIDE-rated all-play-all, Auckland. 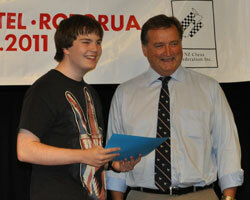 September 11th 2011 - North Island Rapid Chess Championship, Hamilton. September 11th 2011 - Taranaki Rapid, Taranaki. Thanks to John Ansell for the photo and results. 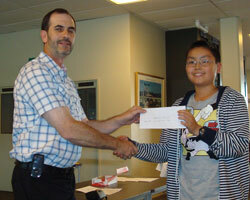 September 8th 2011 - South Island Schools, Ashburton. 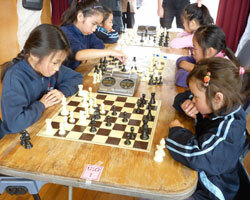 August 30th 2011 - 18th Bush Junior Tournament, Pahaitua. 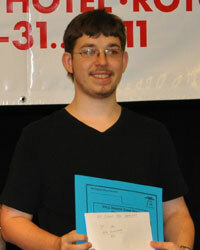 Thanks to Justin Davis for results and photo. August 27th-28th 2011 - North Shore Open, North Shore. Thanks to the sponsors: Pub Charities. August 25th 2011 - Auckland Girls, Auckland. 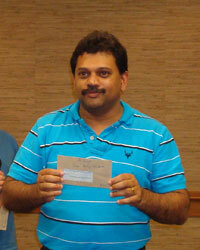 Thanks to Viv Smith for results and photos. 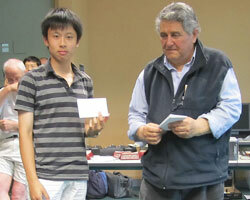 Overall Champion Jiapeng Li from Macleans College playing Black against Joint Under 16 Champion Chuyu Song from Auckland International College. 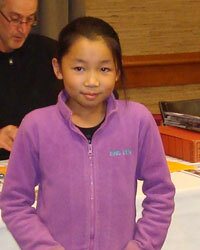 Under 12 Champion Bella Qian from Takapuna Normal Intermediate plays Black against Cathy Fan from Mt Roskill Intermediate. 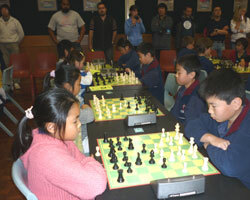 Under 10 Champion Karen Geng from Bockhouse Bay Primary plays White against Under 8 winner Jasmine Pickston from Marshall Laing Primary. 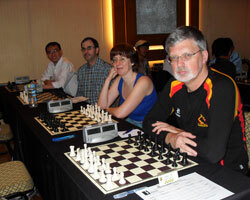 August 18th-28th 2011 - Malaysian Chess Festival, Kuala Lumpur, MALAYSIA. Incorporating a seniors' event, a team rapidplay (27th-28th August), and an Open (18th-25th August). 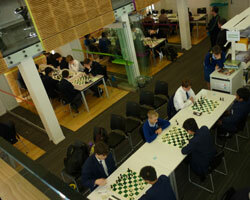 See www.chess-results.com and www.datmo.net. In the Open, Helen Milligan and Bob Gibbons 4/9; Hilton Bennett 3½. 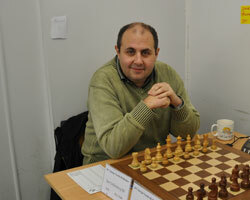 In the Seniors', Paul Spiller scored 4/9. 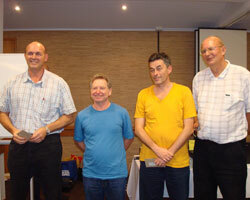 In the Merdeka Team Rapidplay, the Klang Valley Kiwis finished 28th with 20 points out of 36 (Bob Gibbons 3½/8, Hilton Bennett 3½/8, Helen Milligan 6/7, Paul Spiller 4½/8, Edwin Lam 2½/5). 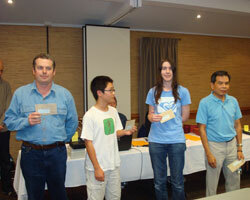 From the left: Edwin, Paul, Helen and Hilton. 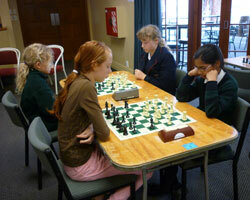 August 14th 2011 - Junior Interclubs, Auckland. 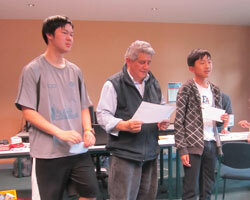 1st Howick-Pakuranga with 8/8 matchpoints (players: Luke Li, Karl Zhu, Judd Zhan and Byron Lam). 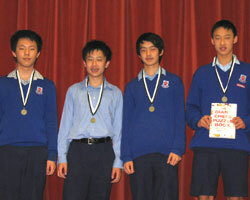 2nd on 6/8 were North Shore (William Zhang, Hao Jia, David Rong and Luke Wang). August 13th 2011 - Waikato Rapid, Hamilton. 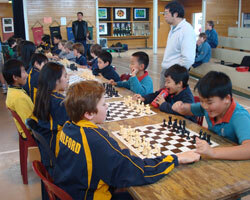 August 11th 2011 - North Shore Interschools, Primary and Intermediate, North Shore. 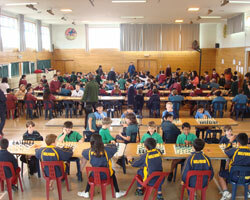 Some photos of the event, which attracted a large number of players from local schools. 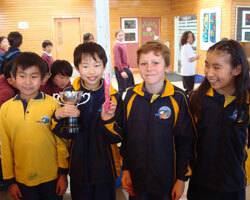 Takapuna NIS won the Intermediate and Milford the Primary. 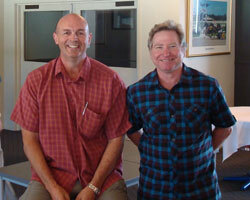 The Takapuna NIS team. The victorious Milford Primary team. 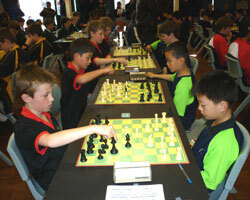 July 31st 2011 - A-Grade Interclubs, Auckland. 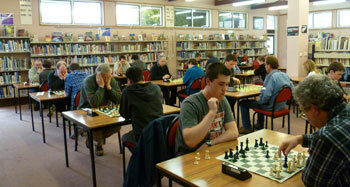 First equal on tiebreak: Auckland Chess Centre and North Shore Chess Club (same matchpoints and same gamepoints). Full results will follow. July 31st 2011 - MC Cup, Auckland. 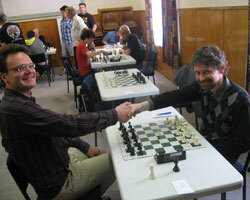 See full results at www.chesspower.co.nz. 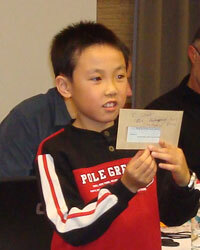 William Zhang was first on tiebreak; Allen Fan was awarded a place in the MC Cup Finals. 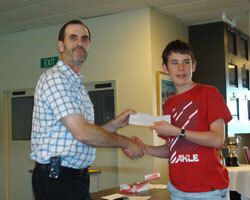 July 27th-31st 2011 - South Island Championship and Rapid, Christchurch. 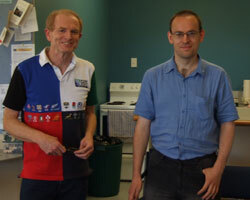 Stephen Lukey is South Island Champion; Roger Nokes is South Island Rapidplay Champion as winner Scott Wastney is from the North Island. 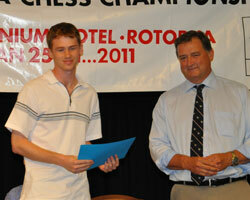 July 26th-29th 2011 - NZ Junior Championship, Howick. Many thanks to the sponsors: Oasis Education, Kingsland Print, Negotiation Plus and Quality Student Diaries. Download the games here (pgn file). 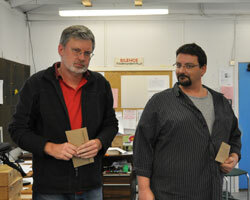 Thanks to Ewen Green and Justin Davis. 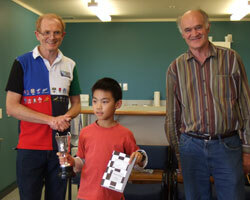 July 25th 2011 - NZ Junior Rapid Championship, Howick. 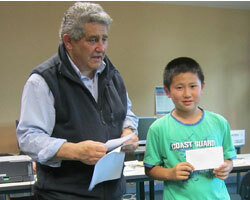 Zhang, William J W: NZ Junior Rapid Champion, NZ Schoolpupils Rapid Champion, and NZ under-10 Rapid Champion. 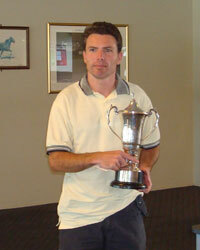 July 16th-24th 2011 - George Trundle NZ Masters Tournament, Auckland. 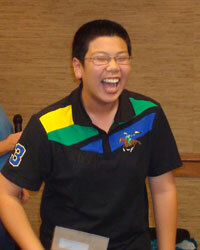 Download Masters games and Qualifier games (pgn files). 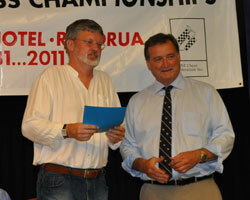 June 21st - July 12th 2011 - Richard Sutton Cup Rapid, Howick, Auckland. 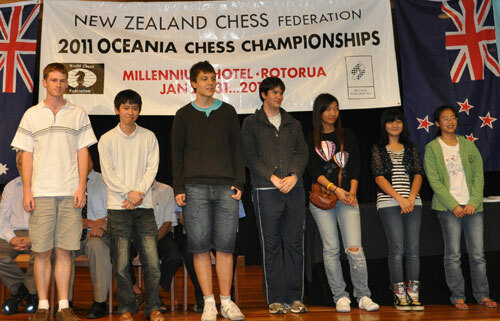 July 1st-4th 2011 - NZ Seniors' Championship, Auckland. 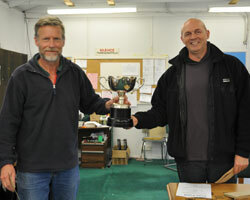 Winner of the Ortvin Sarapu Memorial trophy: Lindsay Cornford. June 28th - July 4th 2011 - 39th Annual World Open, Philadelphia, USA. 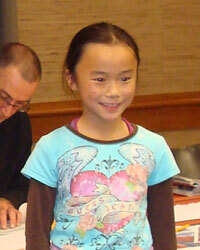 A solid result for IM Puchen Wang, finishing in the prize-money with 6/9 (joint 9th-16th). 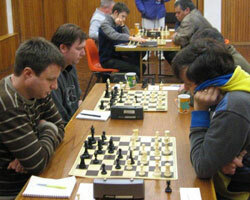 The event was won by GM Gata Kamsky (USA) and GM Michael Adams (ENG) with 7/9. June 25th - July 3rd 2011 - Big Slick International, Purley, UK. 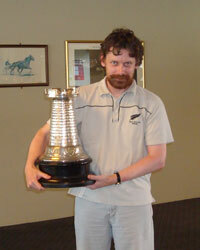 Kiwis Abroad: IM norm for Nic Croad! June 25th 2011 - Upper Hutt Open "25 + 5" Tournament, Upper Hutt. 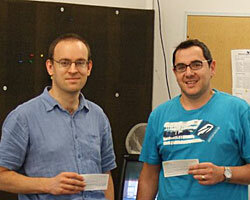 Won by Scott Wastney (left, in the picture - thanks to Justin Davis for this) with a perfect 6/6. June 19th 2011 - Waikato Winter Wapid (WWW), Hamilton. 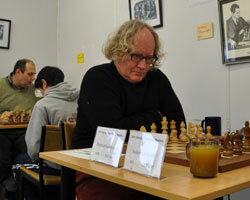 A wet Sunday saw 23 keen chess players battle out the Wapid. 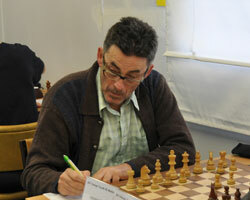 Paul Garbett showed his class with a picket fence score. 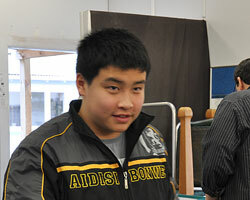 Noel Pinic was 2nd and only lost to Paul, William Lynn won the 1st prize for the U1800 rating group, Bill Li was 1st in the U1500 and 2nd was Ian Kennedy. 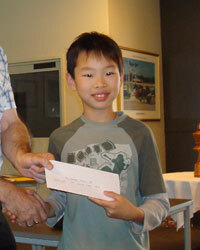 Alphaeus Ang was 1st in the U1200 group. 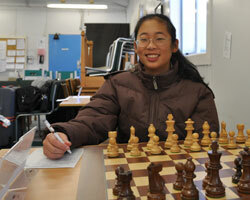 Thanks to Keong Ang for assisting with arbiting during the day and for the players that supported this event, coming from near and far, to help the Hamilton region players develop their chess skills. 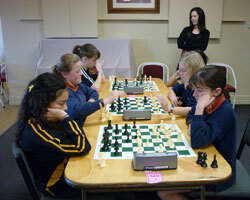 16th June 2011- Bay of Plenty Girls' events, Tauranga. 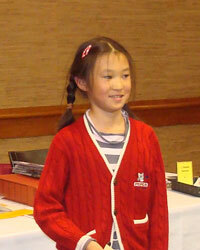 playing White against Catherine Sutton. 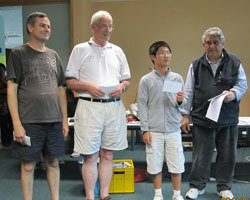 May/June 2011- Fairhurst Pawn Tournament, Howick, Auckland. 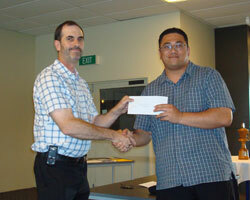 June 4th-6th 2011 - 34th Waitakere Licensing Trust Open, Auckland. 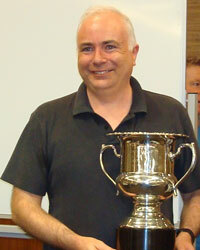 Leonard McLaren won the A-grade despite losing in the last round to Antonio Krstev. May 29th 2011 - Hamilton Rookies Shield, Hamilton. May 1st 2011 - MC Cup, Auckland. 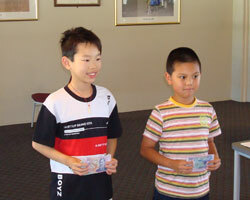 April 27th - May 1st 2011 - Sydney International Open, Parramatta, AUSTRALIA. 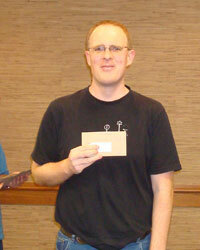 A fine result for Mike Steadman - second equal with 6½/9, but sadly this was not quite enough for an IM norm. 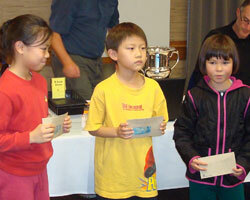 Other kiwi results: Alan Ansell and Luke Li 5, Helen Milligan 4½, Hilton Bennett 4, Bill Forster 3½. 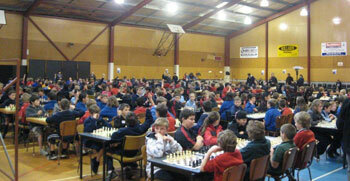 April 22nd-25th 2010 - North Island Championship, Wellington. 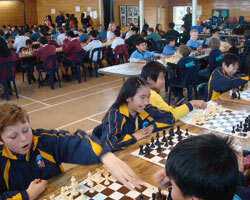 www.chess.wellington.net.nz. Download pgn games file here. 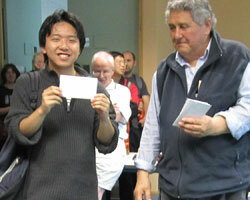 April 21st-25th 2011 - Doeberl Cup, Canberra, AUSTRALIA. 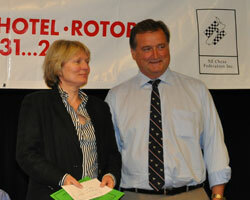 Kiwi results: Mike Steadman 5½/9, Tony Dowden 4½, Hilton Bennett 3½, Helen Milligan 3. April 10th 2011 - Hamilton Rookies Shield, Hamilton. 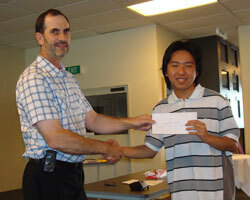 March 27th 2011 - MC Cup, Auckland. March 20th 2011 - Howick-Pakuranga Annual Latvian Rapidplay, Pakuranga, Manukau City. 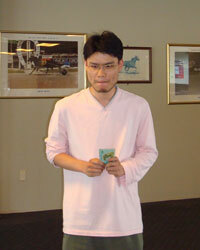 March 13th 2011 - Hamilton Rapidplay, Hamilton. 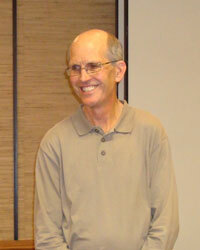 Richard Dare went through undefeated with 5½/6. 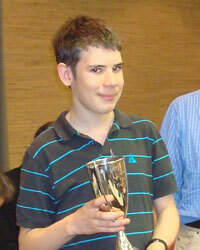 Benjamin Symon won the 'U1200 and U12' group. 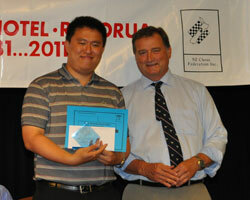 March 5th-6th 2011 - Auckland Chess Centre Weekender, Auckland. February 26th 2011 - Bay of Plenty Rapid, Tauranga. 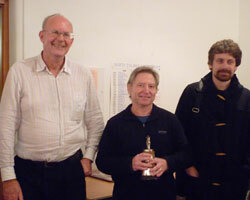 1st= Mike Steadman, Alan Ansell and Noel Pinic (who won the trophy for best local player). 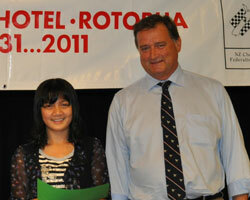 January 25th-31st 2011 - Oceania Zonal 2011, Rotorua. See also the Oceania Zonal pages. 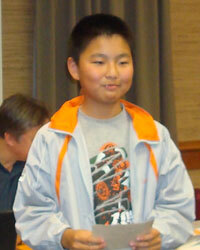 GM Zong-Yuan Zhao qualifies for the next round of the World Championship cycle. 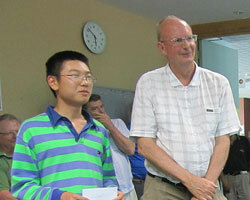 Andrew Brown is awarded the IM title. 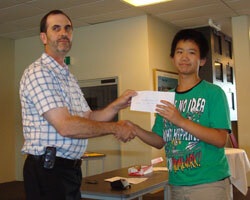 FM titles go to Moulthun Ly and Gareth Oliver. However, Ly has been eligible for the title on rating (over 2300) for a considerable time, without claiming it. 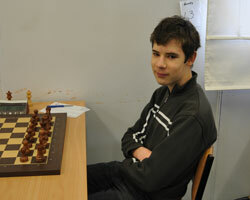 In view of this, it is possible that the next in line, Fedja Zulfic, might be awarded the title. We will have to wait and see. Download Open games here (pgn file). Thanks to the arbiters: Robert Gibbons, Peter Stuart, Craig Hall, Charles Zworestine, and Bruce Pollard. There will be a play-off at a later date between Berezina-Feldman and Guo to decide who wins the place in the next round of the Women's World Championship cycle. 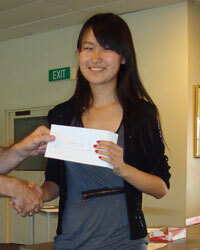 Emma Guo was awarded the wim title. 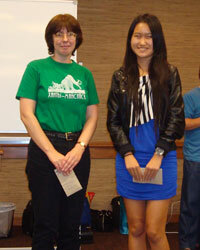 Megan Setiabudi and Nicole Tsoi were awarded wfm titles. 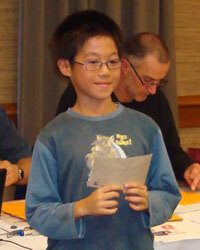 Setiabudi also won the under-1800 grading prize. Download Women's games here (pgn file). wfm Nicole Tsoi All the new title holders: IM Andrew Brown, FM Moulthun Ly, FM Fedja Zulfic (perhaps...), FM Gareth Oliver, wim Emma Guo, wfm Megan Setiabudi, wfm Nicole Tsoi. January 2nd-14th 2011 - 118th New Zealand Congress, Auckland. 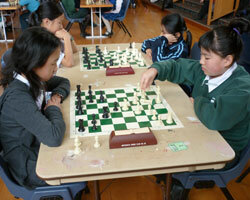 Organised by Auckland Chess Centre. Full details including pairings are available on our Congress Page. 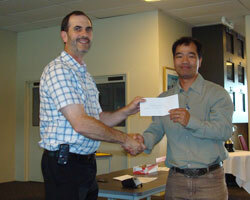 Prizes will be awarded at Congress.